Technology has been changing at a rapid pace and it has affected life of humans drastically. There is not even a single day where technology has not contributed in our daily activities. Humans are so accustomed to these new technological changes that it has become almost impossible to live without them for a day. Not only humans, technology has affected the lives of animals too in many different ways. Cat’s lives have changed with the emergence of technology and they have responded well to these fast-paced changes. 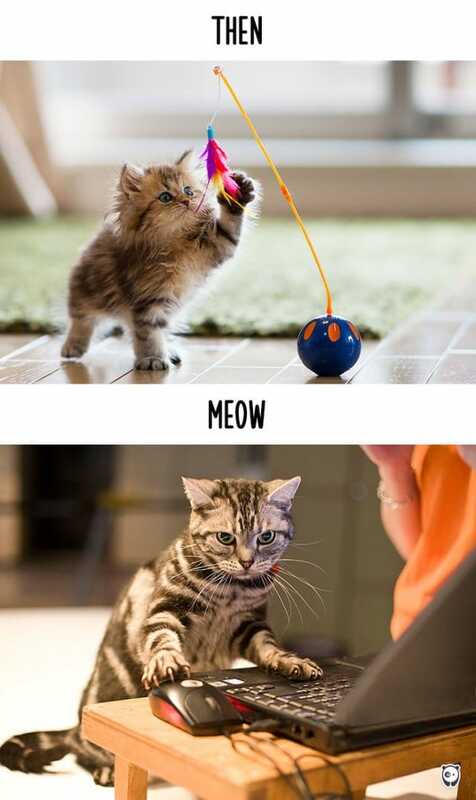 Hard to believe, but the truth is cats have replaced their playing toys with tech. The hanging cables, television, the computer mouse and the funny sounds these gizmos make have all increased your feline friends curiosity and interest in these tech toys. 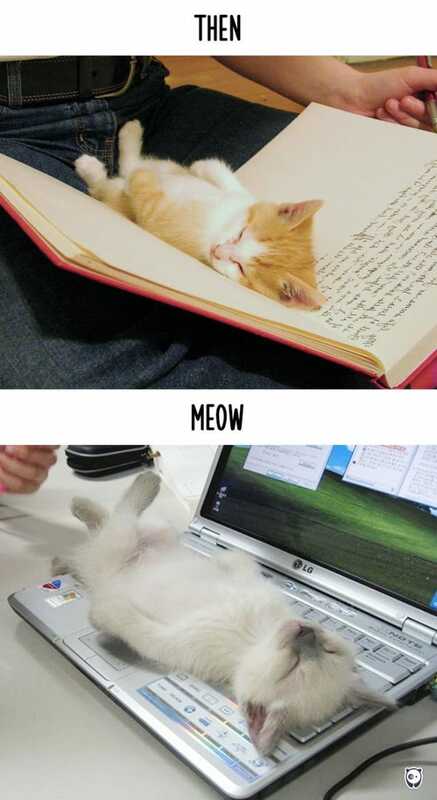 The series of images in this article is a funny take on how technology has changed cat’s lives. Even though the images seem funny, it’s a sad situation for a pet that can’t even differentiate between a real mouse and a computer mouse. Sleeping on an old 90s television was always relaxing. We had a lot of space to curl up. Sitting casually on this television used to provide us with warmth too, but the enjoyment of sitting on the new televisions is not as much as it used to be. Feels like being stuck there with no option to get down. Don’t enjoy sitting on the TV now. People used to read physical books more before technology ensured they read it on their laptops and smartphones. Curling up between the pages kept me warm and secure, but now we have to curl up on these keyboards and bother about the scrolling screens instead of the pages. 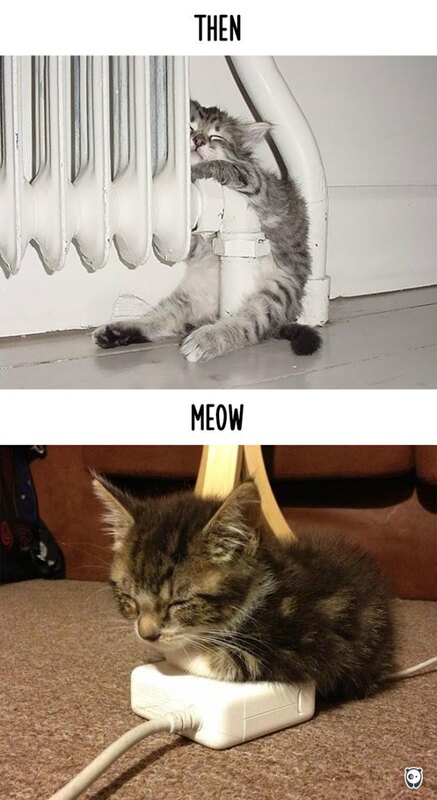 Cat’s lives have certainly changed because of the technological advances. Getting warm those days means curling up in corners behind some plumbing equipment, but now there are room heaters that keep us warm and by room heaters we mean the numerous warm adapters and chargers lying around the house. Life is much more comfortable now as there are many of these everywhere. Hunting used to be fun those days, we used to get a lot of exercise for the body. The prized possession after every hunt used to be fulfilling and made us content. Nowadays you have electronic mouse and yes they call it a mouse. These mice emit light that scares me a lot. All the fun of hunting a mouse is not there with these electronic mice. Moreover, they don’t taste good and doesn’t satisfy our hunger. There was a time when cats found themselves entangled in knitting balls. It was also the era when knitting balls were found inside homes, but now with technological advances, the knitting balls have disappeared as fewer people know the art of knitting. 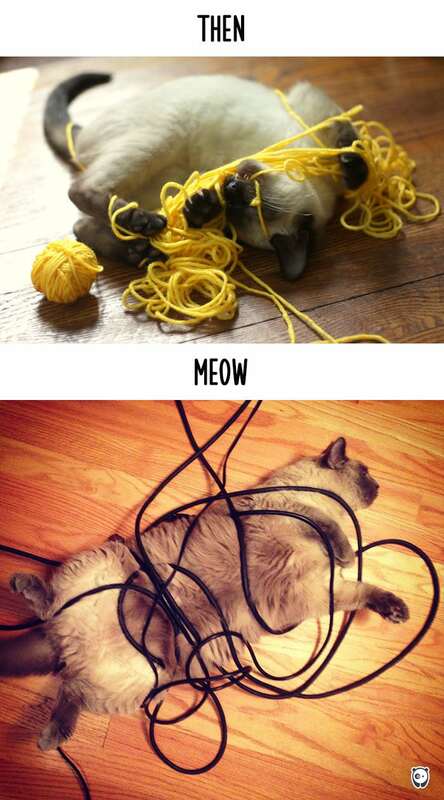 But, in today’s time knitting balls have been replaced by the long wires and cables for cats to play and get tangled. Now it’s a web of wires for cats to play and avoid. 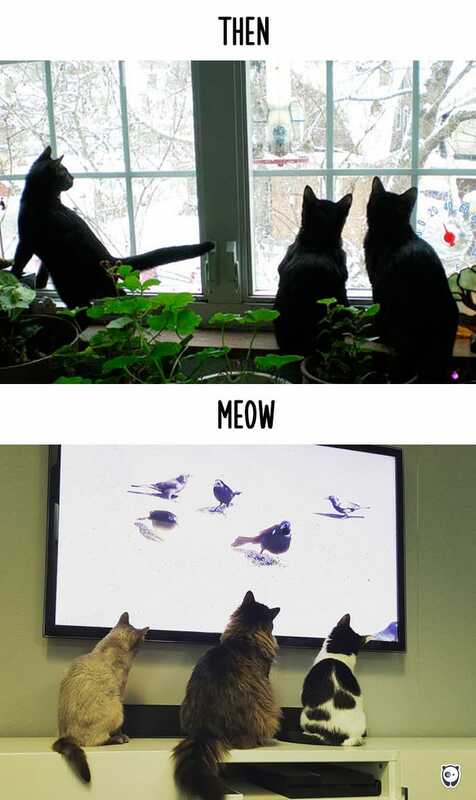 Bird watching for cats were the only ones who used to come and sit on the windows panes or watching the birds flying through the glass windows and dreaming of getting hold of them. Now, there are different shapes, color and sizes of birds on the computer screen to watch and play with. There is no limit to the number of birds you can play. Fishing previously used test a cats hunting skills. Cats loved fishing out the real fish from the water and getting wet in the process, now fishing has been restricted thanks to the technology. There are numerous fish on the iPad, but they don’t provide the same happiness and feel of water as in a pond. Cat markings of the cat itself on itself according to twitter. Catception cat will haunt in your dreams. Catception nowadays is just lying next to a computer screen and see the image of you within a screen. 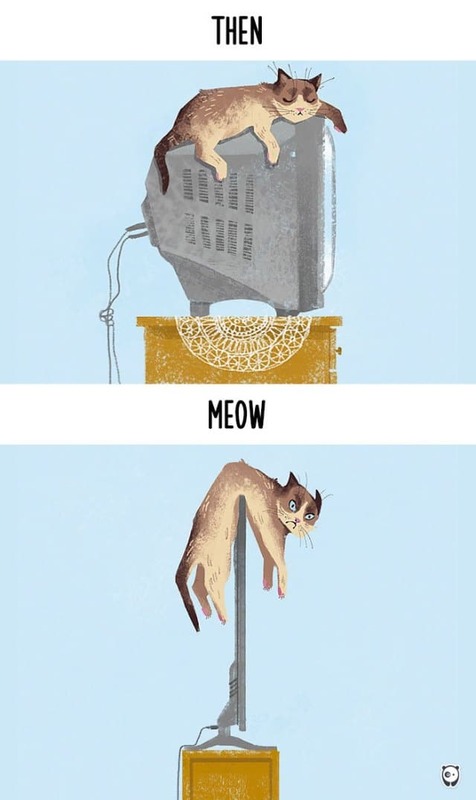 All the technological advances we cats can’t understand. The real feeling of holding a cat in dreams is not there now. Yes, we also love dating, but now that has been shifted to online dating. Technology has taken over the simple courtship activities in our backyard to an altogether different level. 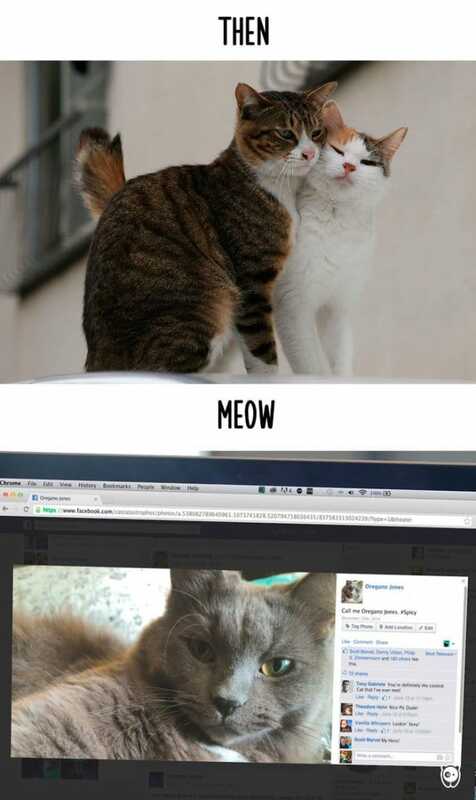 Now, even cats enjoy the online dating sites and the different options they offer. Cyber romance at its best today. Playing used to be tiresome at the end of the day. Cats had number of activities to try out in a day like climbing trees and walls, playing with toys in the house, enjoying with children, etc. Now, even the children in the house are engrossed in their gadgets and the games it has to offer. 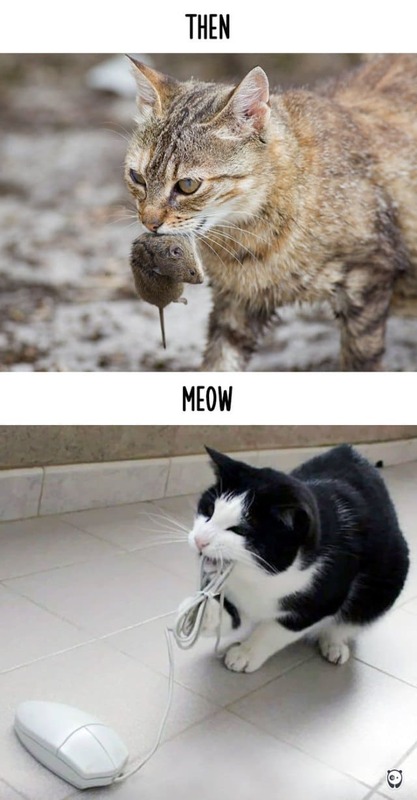 Cats have taken to online games and enjoy them thoroughly. Running then was more exhaustive and through bumpy roads and grass. Shedding those extra pounds was easier then as cats were mostly outdoors and always were alert and active. 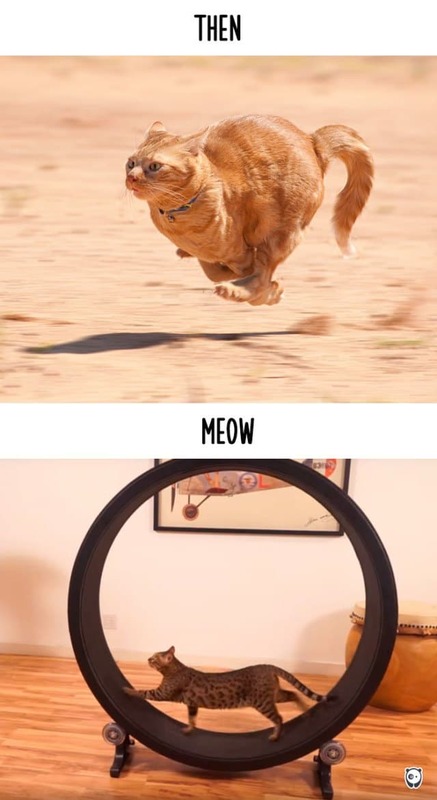 Now, mostly cats are staying indoors and have to run on a treadmill created for them so that they don’t grow obese because they are into online games and have less physical activity. We cats don’t need a house actually, but then houses were made for us that were functional. Technological advances have ensured that the cat enjoys his stay in his custom made house with in-built entertainment systems to keep them entertained. Selfies or photos taken with my human friends were pretty simple and cute. 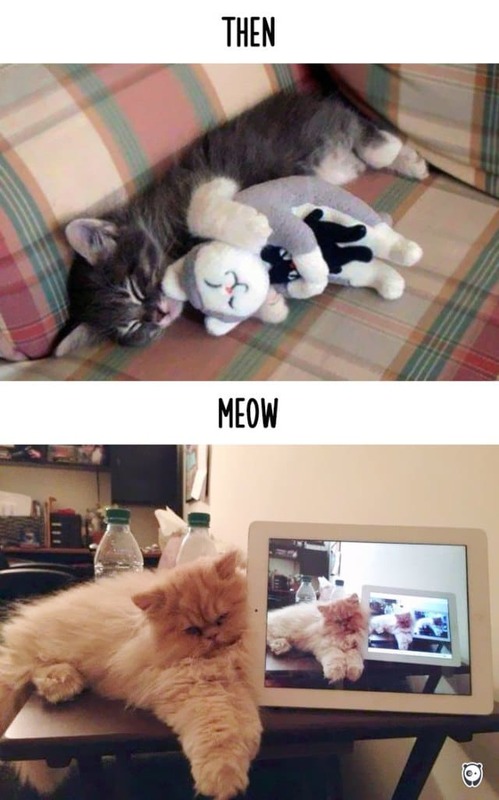 The cats used to look comfortable in the picture, but now with technology cat lives have changed here too. 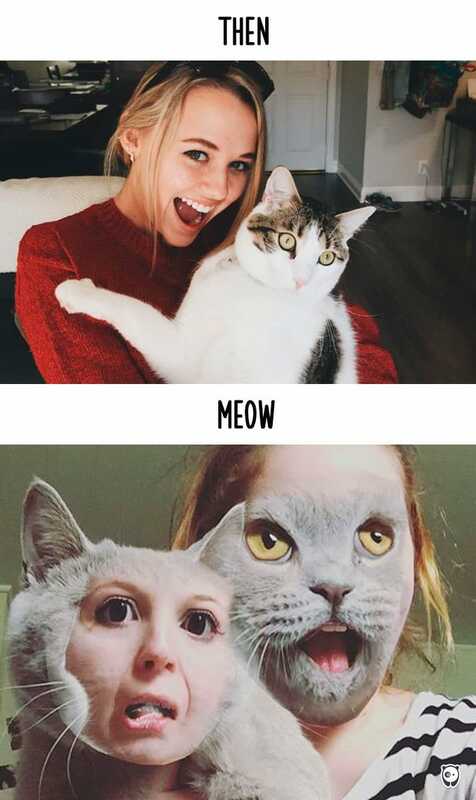 The selfies on the computer can be altered to make it look like a cat having the face of the owner and the owner posing like a cat. Playing then was pretty simple, with fancy and colorful toys to play around with. The toys those days were attractive and served the purpose. Now, the cat is seen playing with the computer mouse and they are made to believe that it is a real mouse. Looking out through the window with friends and enjoying the view and birds outside was the favorite pastime. Now, we do the same on the computer screens. 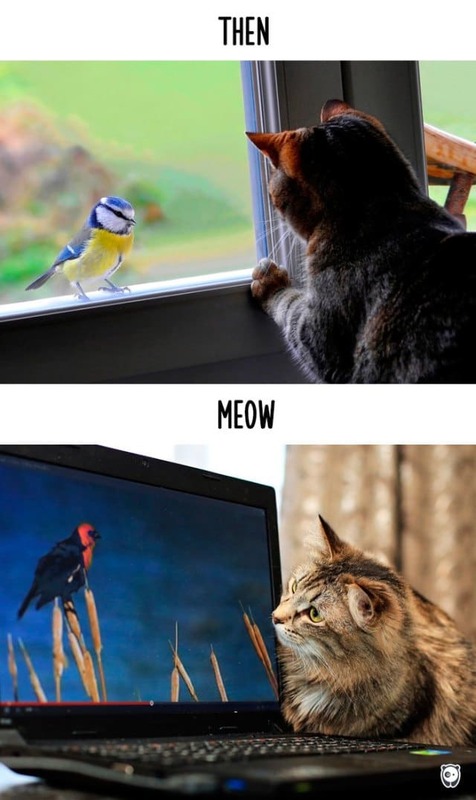 The choice of birds is more on the computer than from looking through the glass windows. Life has changed for humans due to technology and has made it easier for us. 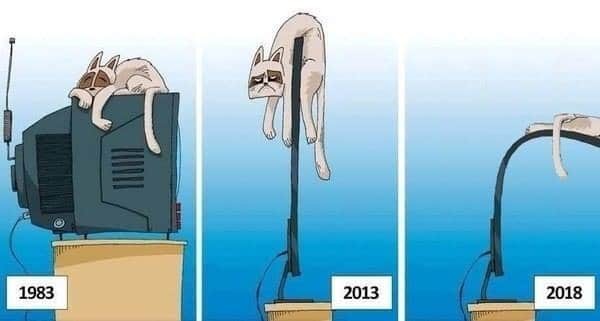 Cats too have been affected by technology in positive and negative ways. 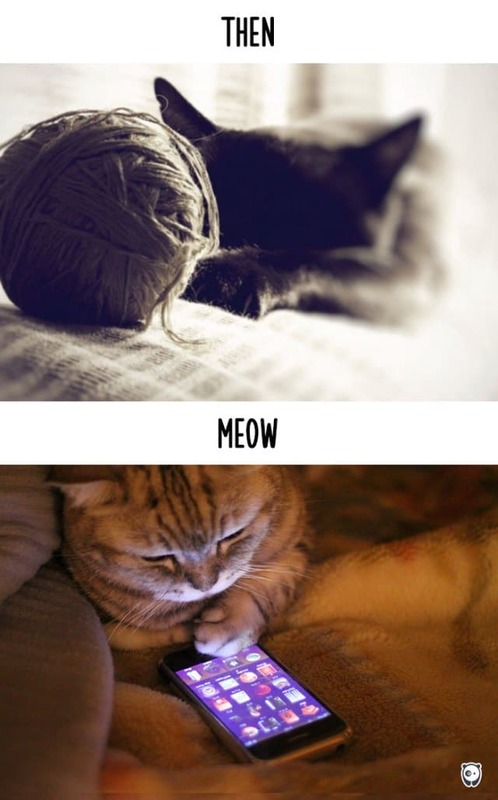 The above images are a fun take on how technology has changed cat lives, though not completely, but in some ways changed the cat lives. 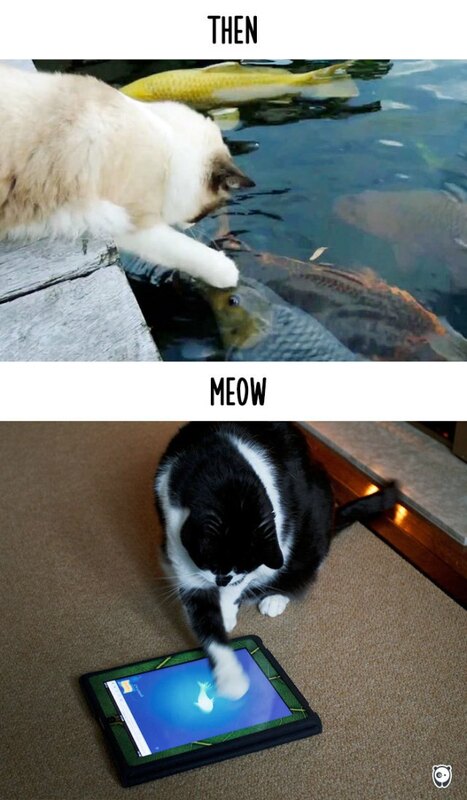 Cats have adapted well through centuries and seem to have adapted to this change as well pretty easily.